I dealt with the pain the only way I knew; painting. Though initially, not even that seemed to help. The only good thing that came out of Paolo and Candy’s engagement was the place I discovered after I ran into the countryside to weep. I found a beautiful spot on the river, the only place that soothed me. I’d start spending more time there than anywhere else. I took the small cottage there as a sign; and decided to start a community. Perhaps for once in my life I could do something useful and share my discovery of this delightful place with fellow painters. So I started a painting club, based at the very spot. It was a place for likeminded individuals to devote themselves to their creativity. I must say it felt amazing to be the one behind this. For a short while, I almost felt happy again. Almost. I met many fellow artists through the club, and finally, I had something to discuss my painting with. In fact, painting was all most of them wanted to discuss. I almost missed the old days of no one sharing my interests. Well, of course I missed the old days. And as hard as I tried to push the thought aside, as rewarding as setting up a painter community was, I couldn’t forget. If only I could erase my own memory. In a desperate attempt to get my mind off of things, I attended a party at the Bluffs. Naturally it was a stupid idea. Several men tried to talk to me; I really wish I had gone for a blander disguise on that day when everything fell apart. But it was too late now. I eventually managed to shake them off and had a moment of peace by the bonfire. It didn’t seem like to long ago, when… Ah, stop it, just stop it. Why do I always do this to myself? Always trying to run away from my past, but never ceasing to think about it…. “How could I forget you… you’re engaged to my friend, Candy,” I recovered. Lucky being a relative term. I looked across to the horizon, hoping for the whole situation to go away. If my alien family ever wanted to take me back to their planet, this would be a great time. “You know, I have a lot of magical memories of this place,” Paolo broke off the silence again. If only you knew… “Oh, really?” I said weakly. “Yeah… Some of them are a little hazy – clearly I must have went a bit overboard on the juice during those parties, but I can remember the feeling. Like, complete happiness, and serenity. It was here where I decided to get a bit more serious and finally settle down. Though, again, the exact moment escapes me,” he laughed. So I dragged myself onto the dance floor, hating every move. He looked so happy, so carefree. I couldn’t stand it. I crept away, leaving the party behind. Well, if I was looking back, why not do it properly? I decided to invite my family for a visit. Disclaimer: This sonnet was written by William Shakespeare. I own nothing. “I should,” I smiled. Paolo had really been making an effort to support my painting lately. It was quite sweet, really. Actually, he’d been surprisingly attentive altogether. I wanted to stop the time, so that our days together would never end. Because I knew there was only a certain amount of time a relationship could stay casual for, and that things would have to end someday. More different than you could imagine. “I… I know I don’t really understand art and books and whatnot, but… I thought we were good together,” he said, dumbfounded. “I don’t.” The lie was harder to say than I thought. To make matters worse, Paolo started crying. I couldn’t bear to see him like that. And then I made a spur of the moment decision. To fix it all. I’d been avoiding using any of my powers, but this was for the best. I got into his brain. And wiped out every single memory of me. I took of my disguise as soon as I got home. I spent the whole night crying. And felt no better in the morning. I called Candy. She’d always be there for me, always cheer me up. “I’m a stranger to him now,” I shook my head. “No, wait, I’ll prove it to you. I’ll alter my disguise,” I stood up. “Go for it,” Candy sighed. So I did. I shed the old me, and created a new one. The dark haired and skinny girl was replaced by a blonde with curves. “I told you,” I said simply. “Wait, Candy, please stay!” I begged her. But she was headed for the door. I should have never told her. I knew it. And so, in a moment of desperation, I did it again. I erased all of her memories of me. After a moment of shock, Candy looked around. Then she looked at me. Ironically, my own head was killing me. Performing two memory wipes would do that to you… I said goodbye to Candy, she made a joke about us being achy head buddies, bless her, and she was on her way. Except that she ran into someone on her way out. “I’m not sure, to be honest… I have this weird feeling like I knew somebody that used to live here,” Paolo said. And that was how Estrella Blossom came into this world. As for Astrid Bloomer… well, for the two people who I cared about the most in Windenburg, it was as if she never existed. “Do you not fit anywhere else? Maybe, just maybe, you could be an Avant Garde,” Maike said. She was actually just citing their promotional blurb that’s meant to entice people to join, you know, the one each of the clubs advertise. But her timing was great. Maybe I could be an Avant Garde. I started to hang out with them at the café a fair bit, and it was refreshing to finally get to talk to people who are a bit more, err, intellectual. I could actually talk about my art with them for a change, and about books and life beyond partying. Of course, some of them were complete pretentious snobs. But some were delightful, like Candy’s little sister Yuki. Who knew? So I got in. And you know what the best part was? They had a computer in their private room at the café, so I could finally email home and get in touch with my family. Wait, did I just say the best part about being in a club was being on the computer on my own? It was then when it hit me. I would never truly fit in and be a part of this world. I used to think it was Newcrest, or my family, and that things would be different here. But it was me all along. I was always going to be a lone wolf. But that didn’t mean I needed to be alone. I spent time with the Avant Gardes to get mental stimulation, and I partied with Paolo and his friends to let go. Funnily enough, when I finally accepted that I wouldn’t fully be a part of any group, things started to fall into place. Paolo suddenly wanted to see me all the time and invite me to all of their gatherings. And I even made nice with the girls. Jade smiled and shook her head: “But it isn’t. Maybe you don’t see it, but he hasn’t been the same with you as he has with any of the others. That’s why I was so jealous. I was going to answer, but Paolo walked over to us and kissed me. Jade danced away, fading into the background. “Yeah,” I nodded and smiled at him. He looked like he was going to say something, but he must have changed his mind, and just looked at me. Strange. Looking back at it, maybe I should have finally used my ability to read his thoughts. But I was too lost in my own, congratulating myself on the balance I had seemingly achieved, so I didn’t. The Bloomer Legacy: 7.5 Where Do You Fit In? Sometimes I wanted to rip them apart. …but the mornings were an awakening, back into reality. And there I was, on my own again. I still needed to figure myself out, find a place where I can fit in. It was then when I got the call. The Paragons wanted me to join their club. I was a bit apprehensive, I must say. “Oh, we just like a good old gossip over some coffee, and naturally, we like to make sure we look good,” Siobhan, their leader, said enthusiastically. They all seemed so excited, so, with a deep sigh, I decided to humour them. When I saw the outfit they picked for me, I wish I hadn’t. They all thought it was hilarious though. She emerged wearing the same clown attire they made me sport earlier. They both thought it was hysterical. I really tried to give them a fair chance, and there were even some moments when I really enjoyed myself. But when Shioban almost had a meltdown when I started to talk to a guy with very unfashionable facial hair, I just knew the Paragons weren’t for me. Luckily, there were no hard feelings. But I still had no answers about where I belong. It suddenly felt like I was back in Newcrest. Back to square one. It was all going great with Paolo. Maybe he didn’t get many of my interests, but we had a lot of fun together. That is, until he invited me to his place and his housemates ruined it all. I knew things with Paolo were just light and fun, but for some reason, my stomach suddenly felt all funny. “Wait, you too?” Jade stared at her housemate, wide-eyed. “So, would you like to test the bed?” he grinned sheepishly as soon as we got into his room. “Are you woohooing with your housemates?” I got to the point. “Your call,” he answered, seemingly unaffected. I resisted the urge to read his mind and crawled back to my house. I’d like to say I didn’t care, but it’s far from true. And so I wallowed. I took off my disguise and wandered around the house aimlessly, eating everything in sight. But things didn’t seem to get better. Disguise on or off, I couldn’t feel like myself again. Luckily, Candy called me up to distract me. She’d heard. “How do you stay so happy all the time?” I examined her joyful face. “So did I,” I sighed. “…a ladies night!” Candy announced proudly. Of course. Because everybody’s answer to pretty much anything in this town is partying. I have to admit though, it did feel nice to get all dressed up and enjoy a couple drinks with Candy. That is, until he showed up. I gave him a quick nod and rushed off to Candy. But soon he was by my side again. But by the end of the night, I ended up with him again. “So, does this mean we’re back on again?” he chuckled. I was probably overthinking it. In fact, I was thinking so hard I started to glow a soft turquise colour at the end of the night. Panicked, I ran out of the club. He was right. Keeping things casual was the way to go. It’s the only way I could make sure my little secret stayed hidden. “It’s not even like that,” I shook my head. “Hang on a second… those are ghosts!” I couldn’t quite believe my eyes. Ok, I guess Candy was right. “Oh, what happened with them?” I asked. Before I could laugh, we were interrupted by a fiery red head. “Ugh, so you’re Paolo’s newest fling, huh?” the girl approached. “Well you should know that you’re not the first and definitely not the last,” she hissed. “Intense is one way to put it… Oh come on Paolo, don’t you remember the amazing time we had together in the promo trailer?” The girl looked at him. I dashed into the house. What was I thinking? I tried to read the backstory of the ghosts, but I was too distracted to really pay attention. Luckily, I stumbled across the one thing that was sure to take my mind off of absolutely anything in this world. An easel, positioned exceptionally well right above the giant maze. Could I capture it in all of its glory though? Once again, I got way too into my painting; by the time I was finished it was completely dark, and the maze looked pretty spooky. But also kind of tempting. It seemed easy enough to get through the maze from the deck, so I figured I should give it a go. To be able to say I experienced it. I mean, I’d be out in no time, right? Ok, maybe it wasn’t as easy as I thought it would be. “Paolo! You’re still here?” I thought I’d be angry the next time I saw him, but I was actually relieved. Must have been the maze. That weak in the knees thing… it was back. I was shocked to hear something so profound coming from Paolo. And I couldn’t agree more. If only he knew… but there was no way I was ever telling him my little secret! “Well that’s kind of the point,” he replied smoothly. Ok, so I got a bit carried away. But I had promised myself I was going to experience all Windenburg have to offer, so I sort of had to, right? To be honest, I was completely taken aback by the connection that Paolo and I made. I didn’t think I could have that with anyone, let alone a guy like him. Day 2. Now that I’d properly unpacked, it was time to explore. I wandered through the streets of the old town centre, though let’s face it, I got lost a fair bit. This place is much bigger than Newcrest! Luckily I came across a number of maps on the way. But better yet, I found an unused easel right in the middle of the town square! It was perfectly positioned for capturing the scenery. It’s official. Windenburg was made for me. It seemed like I was only painting for a few minutes (though, to be perfectly honest, it could have been hours. I lose track of time as soon as I pick up a paintbrush) when a familiar voice interrupted me. “It’s going to be epic,” he winked at me before he walked off. Well, I guess it couldn’t hurt, right? I nodded, thinking about how different these people’s lives seemed compared to everyone back at home. “Anyway, I know it must be hard to be in a new place all on your own,” Candy said, as if she’d read my mind. But of course she didn’t. Unlike me, she wouldn’t know how to do that. Not that I ever use that ability. Sometimes, not knowing is the best policy. “So I just wanted you to know that I’m here for you if you need me,” Candy continued. “That’s really nice of you, I appreciate it,” I smiled, and before I knew it, she was hugging me as if we’d known each other for ages. “That’s what friends are for,” she said. “Ladies, less mushy, more party,” Paolo called over. Admittedly, Paolo didn’t seem to be the sharpest tool in the box, but I couldn’t help but giggle like a schoolgirl around him. Perhaps because I haven’t done a whole lot of giggling when I was an actual schoolgirl. And I think he actually flirted with me several times throughout the night. Not that I’m an expert on the matter. “Oh, this? We’re just getting started, beautiful,” he grinned. I hate to admit it, but the way he said it made me a bit weak in the knees. And made Jade shoot an angry stare at me. I overheard it alright, but I couldn’t wipe a silly grin off my face. And hey, objectively speaking, it was a great night in any case. If nothing else, I made a good friend. Windenburg. I can’t believe I finally made it here, and that I’m lucky enough to call this place home for the foreseeable future. The house I snatched myself is a bargain, right in the historical city centre. The views, the architecture, I couldn’t have imagined it any better. And believe me, I spent a lot of time daydreaming about this place! The wait until I became a young adult was excruciating. But there I was, on my birthday, about to start a new chapter of my life, with my favourite aunt cheering me on. Of course, aunt Yenn has always been my number one cheerleader. I think she realised how difficult my life was going to be early on. A green alien born into the most prominent family in Newcrest can hardly be missed. Especially when the family themselves are unsure how to handle an alien in their household. My dad had always been quite doting, but mom… I think I always made her nervous. Even now, I’m still not sure if she does actually consider herself my mother. As for my older brothers, they were always a bit awkward and goofy around me… but then again, that’s what teenage boys are like. Only these two particular teenage friends had to deal with their friends’ shocked faces when they learned they had a little sister from outer space. Needless to say I grew up trying to avoid people, and feeling like an outsider all the time. Aunt Yenn was the only person that understood me, and that would be able to cheer me up. She told me stories about how she’d traveled to the alien planet of Sixam, about the space rocks she’d collected and the creatures she’d encountered. About the inhabitants of Sixam, who are not much unlike anyone on our planet – some were kind and welcoming, some not so much. We’re all the same, she said. “Hey there,” a cheerful voice interrupted my train of thought. He seemed very upbeat, and kind of cute, actually. I was amazed by the friendliness of Windeburg’s residents, they all seemed so excited to meet me. Apart from Paolo, the visitors included a pretty girl called Jade who barely left his side and when she did, she wouldn’t take her eyes of him. … but my favourite was Candy, a girl whose disposition was just as sweet as her name sounded. She even wanted to see pictures of Newcrest and sounded really interested in my family’s quest of rebuilding it. Overall, I’d say coming here was a good choice. 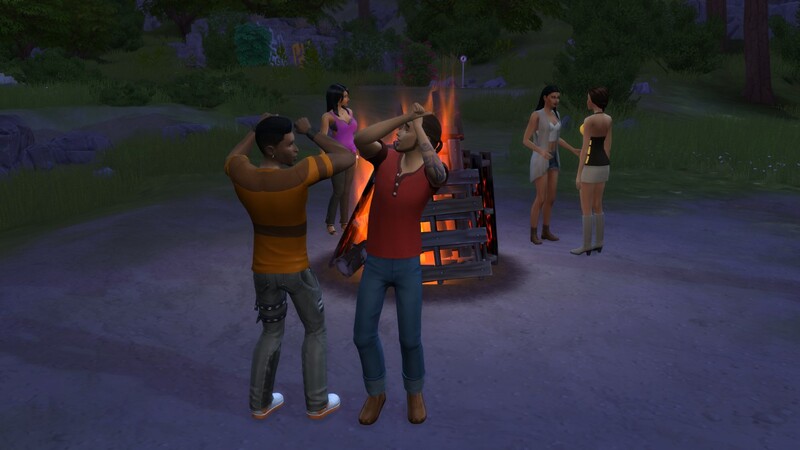 I’ve only been in Windenburg for a day and I’ve already made more friends than I had back at home.